LA ASOCIACIÓN “CUIDEMOS EL ALBIR” Y USAR 13, ORGANIZAN UNA JORNADA DE ENCUENTRO Y ADIESTRAMIENTO CANINO EN LA QUE SE ENSEÑARAN TÉCNICAS PARA PRACTICAR CANICROSS CON NUESTRAS MASCOTAS, TODO ELLO EN COLABORACIÓN CON EL AYUNTAMIENTO DE LÁLFÀS DEL PÍ, Y GINMASIOS CORPORE. LA ASISTENCIA ES GRATUITA Y ESTA DIRIGIDA A TODOS LOS PUBLICOS. EL DOMINGO 3 DE MAYO DEL 2015 A LAS 10:00 A.M, EN EL CAMPO DE GOLF DE EL ALBIR, JUNTO AL BOULEVARD DE LOS MUSICOS. TAMBIEN COLABORAN DYA, ROYAL CANIN, ZARCAR Y OLIVERS OPTICA. THE ASOCIATION “CUIDEMOS EL ALBIR” AND USAR 13, ORGANIZED A TRAINING JOURNEY CANINO WHERE WE WOULD SHOW THEM TECNIQUES FOR PRACTISE CANICROSS TO OUR PETS, THE AYUNTAMIENTO DE LÁLFÀS DEL PÍ, Y GINMASIOS CORPORE COLABORATE WITH US. THE ASISTANCE IS FREE AND IS GUIDED TO ALL PUBLIC. 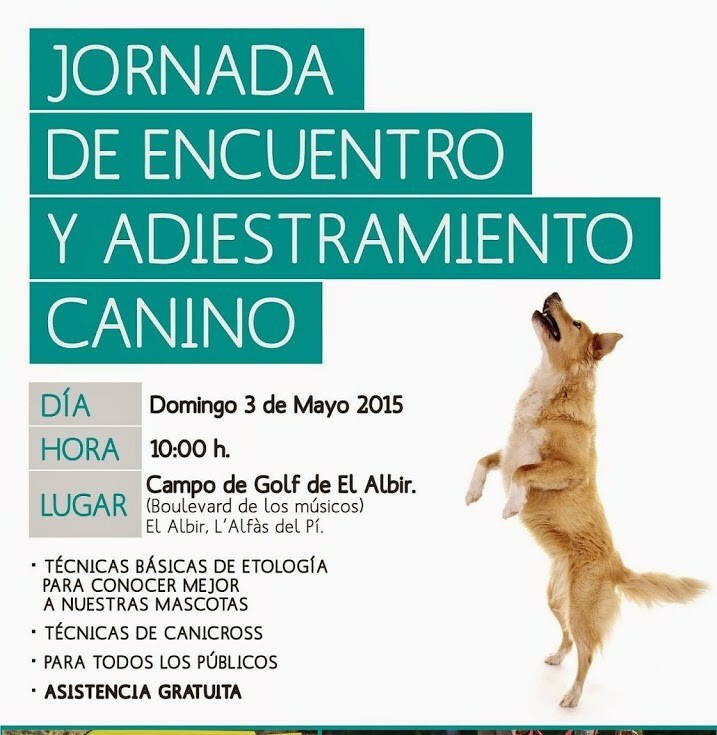 ON SUNDAY THE 3RD OF MAY OF 2015 AT 10:00AM IN THE “CAMPO DE GOLF DE EL ALBIR” NEXT TO THE BOULEVARD DE LOS MUSICOS. DYA, ROYAL CANIN, ZARCAR AND OLIVERS OPTICA ALSO COLABORATE.